DYMATIZE PRE W.O. REVIEW - A Worthy Contender! Dymatize has not been a serious player in the pre-workout category for a long time but they are planning to change all that with the upcoming release of the Dymatize Pre W.O. Promising to be their best pre workout to date. Honestly, being their best so far is not a serious challenge. But introducing a fully dosed pre-workout with the Dymatize name behind it is something worth your attention and we are all set to give review the Dymatize Pre W.O. COMPARE PRICES FOR Dymatize Pre W.O. The Dymatize Pre W.O is available in a 20 serving 400g tub. That’s a MASSIVE 20g serving size. A quick look at the label and you’ll see that more than 90% of them (18g) are active ingredients. That is some serious action taking place. 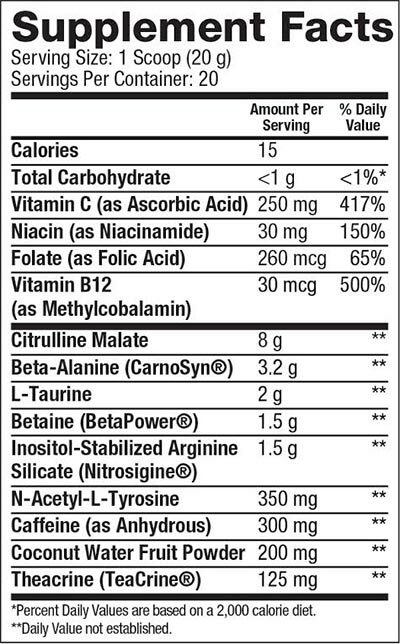 Citrulline Malate (8g) WHOA! Dymatize get serious right of the gate. This incredibly powerful nitric oxide booster L-Arginine in effectiveness yielding greater vasodilation, vascularity, and pumps. L-Citrulline also enhances athletic performance by enhancing ATP production in the body, boosting endurance, and supporting lean mass gains. And at 8g it beats a lot of its direct fully dosed competition. Inositol-stabilized Arginine Silicate (1.5g) Is a complex that binds arginine with silicate to unlock powerful synergistic effects. It can help build nitric oxide levels over time to support healthy circulation and blood vessel integrity in the body. 1.5g is literally double of what we are used to see! Beta-Alanine (3.2g) Beta-alanine is a non-essential amino acid. Unlike most amino acids, it is not used by the body to synthesize proteins. It works together with histidine to produce carnosine. Which is stored in your skeletal muscles to reduces lactic acid accumulation in your muscles during exercise. This helps to improved performance. 3.2g of Beta Alanine is the recommended dosage for full effect. Betaine (1.5g) Betaine Anhydrous, also called Trimethylglycine, is becoming popular as a pre-workout performance enhancer. Several studies have concluded that Betaine is capable of increasing strength, muscle size and enhancing aspects of recovery. We are used to seeing Betaine at 2.5g in fully dosed Pre-Workouts but 1.5g is definitely a respectable amount. L-Taurine (2g) Taurine is one of the non essential Amino Acid that helps pull extra water in muscle cells, which supports hydration, endurance, and gives some pretty sweet water-based pumps, there’s also research that shows that Taurine can help to bolster your focus during workouts. 2G is at the top of the range. Coconut Water fruit powder (200mg) The short story is Hydration & Digestion support. The longer one is: Coconut water is made of many naturally occurring bioactive enzymes such as acid phosphatase, peroxidase, catalase, dehydrogenase, diastase, RNA and polymerases. All of these enzymes work together to aid in digestion and metabolism. Coconut water also supports detoxification and is a good source of B-complex vitamins. N-Acetyl-L-Tyrosine (350mg) Bring on da focus….Is an acetylated form of L-Tyrosine. It breaks down to L-Tyrosine in the kidneys and is more soluble than Tyrosine supplements. It has been shown to enhance cognition during workouts. Theacrine (125mg) Works naturally together with the body to supplement energy and motivation. Theacrine is very similar to caffeine, but is longer lasting and provides more benefits than just being a stimulant. 125mg is a hefty amount! Available in 3 flavors on launch day, we tried HAND SPUN COTTON CANDY flavor which taste GREAT! No after taste or chemical flavor. It is on the sweeter side but that is expected with a COTTON CANDY flavor. SO keep that in mind if you don’t have much of a sweet tooth. PreWO launches at $39.99 for 20 servings which puts on the top end of the category as the rest of the fully dosed pre-workouts it is positioned to compete with. Right at the C4 Ultimate which boasts a similar profile. Obviously. the best way to compare prices & get a great deal on Dymatize Pre W.O or any other supplement, is to keep on checking our site, as we continue to hunt down the best deals for everything fitness. Dymatize have waited awhile to bring out a serious Pre-Workout, and maybe this is the reason why. They have definitely spent some time putting together a well thought out Blend. Definitely looks to be higher up on the potency scale in terms of Energy. So if you are looking for a well rounded pre workout with a unique great taste and if the price is right, the Dymatize Pre W.O might be what you are looking for. Not sure which Pre-Workout is right for you? Check out our top 10 Pre-Workout list, or check out the latest hot deals from around the web on pre-workouts & anything Fitness!